Do words appear to move, wobble or flicker when you read for any length of time? Do your eyes get tired or do you get headaches when reading? You might be one of the 20% of the population who suffers from a condition known as Visual Stress. Visual Stress is thought to be caused by hyperactivity of certain groups of cells in the brain. The good news is that the symptoms can often be reduced by using a coloured overlay, coloured lenses or by changing the background colour of the screen or tablet that you are looking at. The ReadEZ system was developed at City University London by a team led by optometrist and visual scientist, Professor David Thomson. The system is used by over 400 Opticians and in many hospitals and schools and our coloured overlays, coloured lenses and screen tinting software are now used by 1000s of people around the world. Have you had a recent eye examination? Before considering Visual Stress we strongly recommend that you have a full eye examination by an Optometrist to eliminate the other common causes of reading difficulties and to ensure that your eyes are healthy. Why not try ours instead? They are made to the highest standards and are very competitively priced. If you are not sure which colour to choose, try our Overlay Selector. You may find that the best colour for lenses is slightly different to the colour of your overlay. For a comprehensive test or to have coloured lenses put into your spectacles, one of our ReadEZ Test Centres will be delighted to help. Alternatively, you could try our ReadEZ Clip-Ons. Use our online Clip-on colour selector to select the best colour for you. You can use our ReadEZ Virtual Overlay program to tint your PC Screen to the most comfortable colour for you. Reading is a complex task requiring good vision and some complex processing in the brain. Reading difficulties may be caused by the way information is “processed” by the brain- a condition referred to as dyslexia. If you think your child may have dyslexia, the first step is to speak to their teacher or their school’s special needs coordinator (SENCO) about your concerns. They may be able to arrange for an assessment and if the diagnosis is confirmed, they may be able to offer additional support. 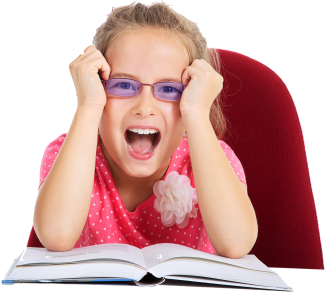 In some cases, reading difficulties can be caused by vision problems such as long-sightedness, astigmatism or problems coordinating the eyes. This can be ruled out by having your child’s eyes examined by an Optometrist. 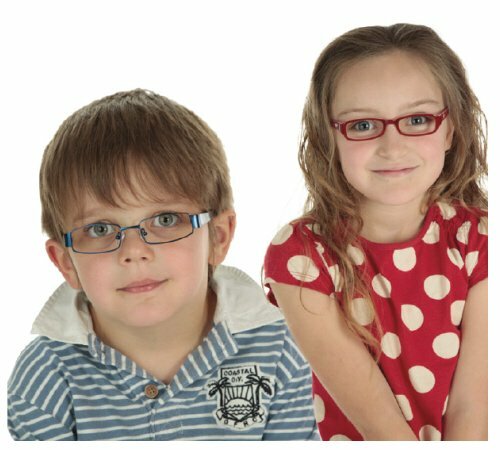 Eye tests are free for children under the age of 16. If having ruled out dyslexia and checked that your child’s eyes are healthy, your child is still having problems reading, they might be one of the 20% of the population who suffers from a condition known as Visual Stress. Visual Stress is thought to be caused by hyperactivity of certain groups of cells in the brain. This causes discomfort while looking at stripy patterns including rows of text. Sufferers often report that the words appear to move, wobble or flicker and sometimes complain of eye strain or headaches after reading. The good news is that the symptoms can often be reduced by using a coloured overlay, coloured lenses or by changing the background colour of the screen or tablet that they are looking at. Have you spoken to your child’s teacher? Before considering Visual Stress we strongly recommend that you rule out the possibility of dyslexia by sharing your concerns with your child’s teacher or SENCO. Has your child had a recent eye examination? Before considering Visual Stress we strongly recommend that they have a full eye examination by an Optometrist to eliminate the other common causes of reading difficulties and to ensure that your eyes are healthy. You may find that the best colour for lenses is slightly different to the colour of their overlay. For a comprehensive test or to have coloured lenses put into their spectacles, one of our ReadEZ Test Centres will be delighted to help. Alternatively, they could try our ReadEZ Clip-Ons. Use our online Clip-on colour selector to select the best colour. They can use our ReadEZ Virtual Overlay program to tint their PC Screen to the most comfortable colour. It is estimated that up to 20% of children experience a condition known as Visual Stress. This condition, thought to be caused by hyperactivity of certain groups of cells in the brain, causes discomfort while looking at stripy patterns including rows of text. Children with the condition often report that the words appear to move, wobble or flicker and sometimes complain of eye strain or headaches after reading. The good news is that the symptoms can often be reduced by using a coloured overlay, coloured lenses or by changing the background colour of the screen or tablet that they are looking at. This condition is not the same as dyslexia although children with the condition may exhibit similar behaviour. The ReadEZ system includes a powerful screening tool which runs on a PC. This allows eye care professionals, teachers, educational psychologists and others to rapidly identify children with the condition and determine the optimum colour for an overlay or lenses to minimise the symptoms. Based on the results of this screening, we can then supply a range of high quality overlays and lenses for the children. The software is already in use in 100s of schools in the UK. Alternatively, you could recommend that the child has an assessment at one of the 400 or so Opticians who use the system. Be aware of the condition? 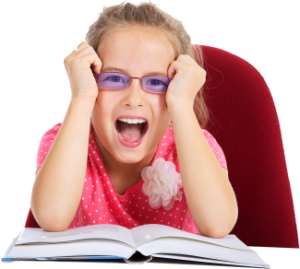 If you notice that any children in your school are experiencing discomfort while reading, you should consider the possibility of Visual Stress. Visual Stress can co-exist with conventional dyslexia and other specific learning difficulties. Has the child had a recent eye examination? Before considering Visual Stress we strongly recommend that children have a full eye examination by an Optometrist to eliminate the other common causes of reading difficulties and to ensure that their eyes are healthy. The best colour for lenses may be slightly different to the colour of their overlay. For a comprehensive test or to have coloured lenses put into their spectacles, one of our ReadEZ Test Centres will be delighted to help. Alternatively, they could try our ReadEZ Clip-Ons. Use our online Clip-on colour selector to select the best colour. If you are an Optometrist, Dispensing Optician or Orthoptist, you could add Visual Stress Management to the portfolio of clinical services you offer. ReadEZ is the modern, efficient and cost-effective system for diagnosing and managing Visual Stress. We can provide you with the Screening Software, coloured overlays, coloured lenses, screen tinting software, Uncuts and Glazing Service to get you up an running. The software is simple to use and we will provide you with the training and support that you need to become a ReadEZ Test Centre. The name of your practice or clinic will then be added to our database to enable visitors to this site to find you. Why not join the 400 or so eye care professionals who are already using the system. I was quoted over £400 for coloured spectacle lenses. I went to one of your ReadEZ Test centres and they made me some glasses for a fraction of that and they work brilliantly.